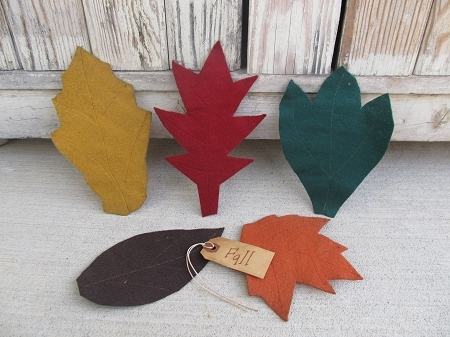 Primitive Autumn Fall Leaves Bowl Fillers Set of 5. What I love about these leaves is that they work so perfectly with other bowl fillers to put together a wonderful fall display. You can also lay these down around arrangements as well. In this set you'll get 5 leaves in beautiful fall colors of dark green, harvest orange, burgundy, tan and a golden mustard. Made from stiffened felt with stitching to show the veins in the leaves. Also includes a primitive tea stained tag that have various Fall sayings. They are flat so you can decorate the top of a table with them or line a bowl filler bowl with them and even add some of her pumpkins to top it off. Hand made by my Mom. A great fall accent for your home. Size of the biggest one is 9 1/2"x5" and the smallest is 4"x3 1/2"